Amazing architecture, bustling subways, large warehouses, and more; Chicago is a busy metropolis that shows no signs of slowing down. Large amounts of young and older generations move to Chicago every year for the city’s thriving food and art scene, as well as the plethora of career opportunities. Chicago is a great city with plenty to offer, and its residents are eager to keep its charm alive. That is where warehouse, construction, and repair workers come in. They are the professionals that keep Chicago running at its fullest potential. If you’re interested in boosting your career AND becoming a part of the effort to maintain this historical hot spot, you should look into the many forklift jobs available. A forklift is a large piece of machinery that is used in many structural and architectural renovation projects, as well as on new building sites. Workers need training to use them to reduce the risk of injury and fatality. What Are Some Forklift Jobs in Chicago? Forklift jobs also include working for airports, such as O’Hare and the Chicago Midway International Airport. And, for the many retail warehouses of the stores located on the famous Magnificent Mile. How Can You Qualify for These Jobs? The best and fastest way to become an eligible candidate for any of the forklift jobs listed above is to complete forklift certification in Chicago. More and more employers are looking for certified workers because the Occupational Safety and Health Administration (OSHA) cracks down on employers with hefty fines. Training also helps to decrease the number of injuries and fatalities on worksites, which further reduces litigations, and loss in production and progression. Workers can become certified to operate forklifts and be 100% OSHA compliant with the training from CertifyMe.net. This particular training program is online and takes only 60 minutes on average to complete. If you are looking to apply for a forklift operator job, go to the CertifyMe.net website, create your account, and start your forklift training in Chicago from the comfort of your home or during a lunch break at work. Once you’ve finished the program, you will be able to print your certification and take it with you to your forklift job interview. 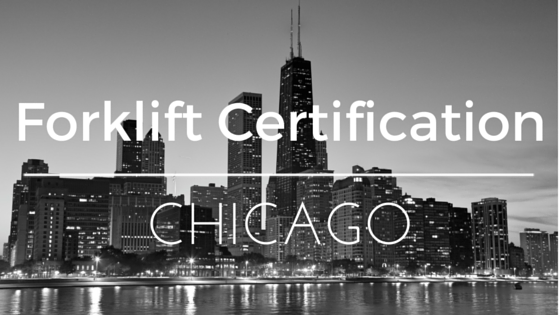 Forklift certification in Chicago is a smart career move, and it doesn’t require any traveling to an offsite training facility, hundreds of dollars, or hours of your time. Don’t wait another moment—Sign up for forklift training in Chicago today!